The Westminster 7:10 Rotary Club Foundation, Inc. is a 501(c)(3) organization that supports the Westminster 7:10 Rotary Club in its work to provide funds for charitable and educational purposes. Preference for funding is given to projects or organizations which are involved in charitable or educational efforts in the Westminster area, and also to those supporting efforts to improve water conditions, literacy, health and hunger, and child health, worldwide. Contributions from members of the Westminster 7:10 Rotary Club. Contributions from individuals, families and businesses. Fund raisers organized by the Westminster 7:10 Rotary Club. HOW IS THE FOUNDATION Administered? A Board of Directors comprised of active members of the Westminster 7:10 Rotary Club who administer funds and establish policies regarding their distribution. According to its Articles of Incorporation its purpose is to receive, invest, administer and spend funds consistent with a non-profit corporation and to promote the Ideals of Rotary in the areas of Community , Vocational , and International Service. WHAT KINDS OF PROJECTS DOES THE FOUNDATION SUPPORT? The Computers for Kids program, which has collected, refurbished, and given over 7,580 computers to qualified students, primarily in the Westminster area. The Dictionary Project which has given over 3,000 dictionaries to 3rd graders. Imagination Library?, sponsored by The Dolly Parton Foundation, provides books to children from birth to five years old with one book a month. Scholarships to Westminster High School students to attend four year colleges, and to Front Range Community College students ,as well as leadership training programs to high school and middle school students. A partnership with Socially Conscious Coffee to improve a school in Brazil. A partnership with Friendship Bridge to loan funds to impoverished women in Guatemala. Plus a host of other worthy local and international projects. Westminster 7:10 Rotary ClubFoundation, Inc.
by making a tax deductible contribution! 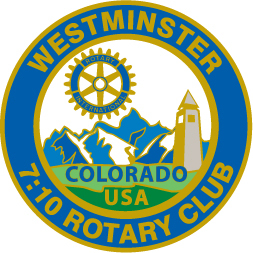 Westminster 7:10 Rotary Club Foundation, Inc.